Today, Downtown Lowell’s Memorial Hall is mostly known for the Pollard Memorial Library it houses, named for the city’s late mayor Samuel S. Pollard. For its first 90 years, until its renaming in 1981, Lowell residents and visitors knew it as the Lowell City Library. The library’s building, Memorial Hall, was built to remember the sacrifices of Lowell’s Civil War dead. Local surviving members of the Grand Army of the Republic (G.A.R.) expected that the Hall would provide them a meeting place, at least for special occasions, if not on a regular basis. Fort Hill. (This option was eventually dismissed as Fort Hill was seen as too remote for veterans, and was the location most likely to attract loafers and vacationers, rather than the veterans it was meant to serve.) Another option would have created a municipal building with the upper floors dedicated to G.A.R. meetings. 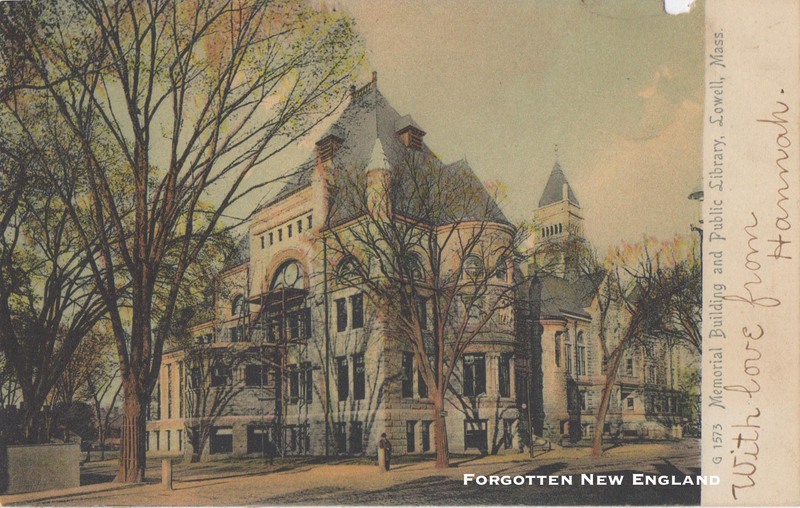 (This option eventually morphed into Lowell’s City Hall building, which was completed a few months after Memorial Hall.) The last, and winning, proposal called for the building of a new city library that included space for G.A.R. meetings. All agreed that the Memorial Hall should be a ‘grand and imposing edifice’, to adequately recall the men and deeds that they hoped to commemorate. The history of Memorial Hall is firmly intertwined with the City Hall building next to it. (Its tower can be seen in the postcard view, above.) 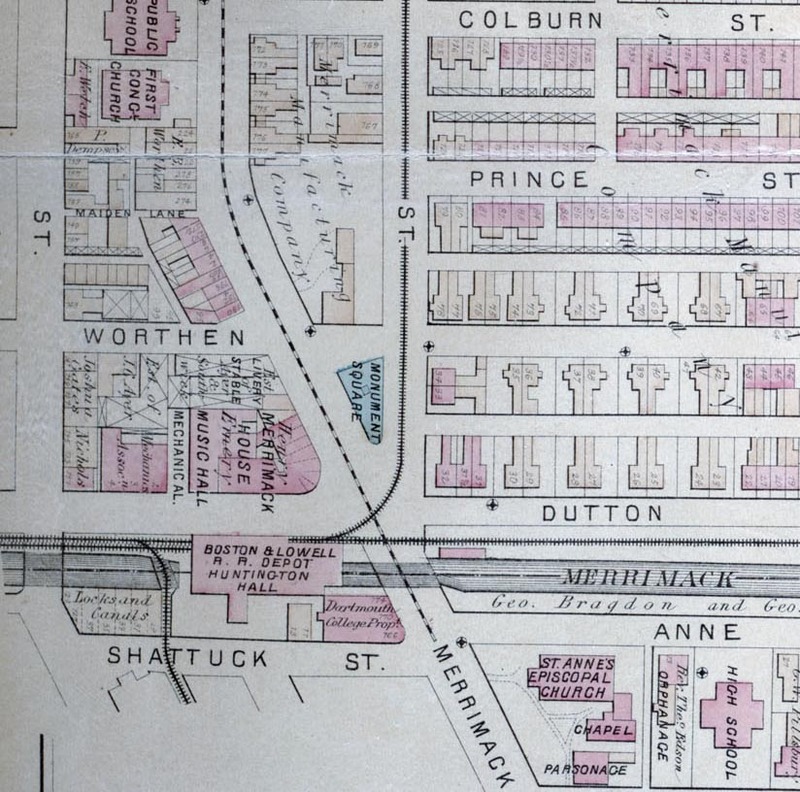 Their cornerstones were laid on the same day: October 11, 1890, and both took nearly three years to complete. The Memorial Building opened to much fanfare on June 3, 1893. A procession marched through Highland, Elm, Central, Merrimack, Moody, and Colburn streets, ending at the new Memorial Building. Prayers were offered by Rev. Dr. Chambre. An American quartet sang songs, and the keys to the building were presented to Mayor Pickman. Speeches were delivered by the Mayor, members of the local posts of the G.A.R., and former mayor and future governor Frederic T. Greenhalge. As the exercises concluded, the officials opened the new building for public inspection while the quartet played “”Soldier’s Farewell”. This library an architectural treasure. As I recall from a research trip some years ago, the rich wood paneled interior and stained glass were gorgeous. Thanks for another fine article. Hi Christine – I grew up visiting the Lowell City Library/Pollard Memorial Library. I’m hoping to do a post just on the interior: the wood paneling, the stained glass, the elaborate carvings . . . it really is an inspiring building. Thanks for your comment!